As a new, or even not so new, direct sales or party plan consultant, you might not know what to say when you are talking with people about booking a party, joining your team or even just about your business in general. Or you might be worried that you are coming across as pushy or aggressive. Remember that truly successful marketing always starts with serving others and building relationships. This means you want to focus on how you can help them, what solutions and services you can offer and provide to the person. Ask open-ended questions and questions that get them thinking. This means questions that require something other than a yes or no answer. This helps the conversation continue to flow and builds rapport and connection. Another key tip is to be positive and think positive. Assume that they are going to be receptive, excited and accept what you have to offer. If not, don’t take it personally. When you are focused on serving others, you have nothing to fear because you are offering them something of value. Don’t let a few no’s stop you, not everyone will be interested in what you are offering and that is okay! We want to work with those who want, love and need what we have to offer. I can promise you there are plenty of people out there that do love, want and need what you have to offer. Below are a few sample scripts & word choices you can use to give you some ideas and a successful start when talking with people about your business. I have put together a FREE 3 Page Download with the 3 script below as well as business opportunity scripts AND word choices to overcome common objections for sales, party bookings and team building. Enter your email below to get access right now to the download for FREE! YES, Send me the FREE Word Choices Download! “I am so excited about my new business, I am having so much fun getting to give away free products and helping people make an extra income each month on their own schedule. I am just looking to build up my customer list now and wondering if you might know someone that might be interested in earning $100 in free (company name here) products just for having a few friends over or doing an online show or that might be looking to earn an extra $100 a week? I pay for referrals” (give them a little gift for anyone who books or joins your team). Who do you know that might be interested? “I am so excited about my (company name here) business, I am having so much fun getting to give away free products and helping people make an extra income each month on their own schedule. I wanted to make sure you knew that I now offer this (service, solution, whatever your product/company provides for people) & can help you & your friends with (solution your company provides, earning free products, extra income…) I am reaching out to a few select people who I thought might be interested & you came to mind because (compliment them here, you were so much fun at that XYZ party you held, you mentioned you love our products, you always throw the best parties, you were wanting this product set that’s now the host offer…) & I wanted to give you the first chance to host a party & get (bonus gift) for free for booking with me during (current or next month). Would next week or the following week be better for you? Ok 2 weeks out, are afternoons or evenings better? Ok evenings, great, I have Thurs & Fri of that week available, which one works best for you? Friday, great, how about 7pm? Perfect I will put you down and get you a party packet sent out and then follow up on some things you can do to have an awesome party once you receive your packet. If you are brand new, you can also go the route of booking “practice parties”. “Hi _______, how are you doing? (let them answer, they will usually ask how you are doing). Oh, I am great, I am so excited about my new business. (Stop & take a breath here, if they are interested they will ask you “New Business? What are you doing now? Then you can continue the conversation…) I am having so much fun getting to give away free products and helping people make an extra income each month on their own schedule. I wanted to make sure you knew that I now offer this (service, solution, whatever your product/company provides for people) & can help you & your friends with (solution your company provides, earning free products, extra income…) I am just getting started and am booking some practice parties to help me be able to learn how to do my job to the best of my ability. I am reaching out to a few special friends to see if they will allow me to set up and practice doing a party with them and a few of their friends one afternoon or evening. It’s a no pressure party but when your friends attend and order you will get to be the host of the party to earn free products. I’ll even give you a bonus gift for helping me get my business started. It will be a lot of fun & really help me out too. I have a few dates open & can get you all set up right away. Would next week or the following week be better for you? Ok 2 weeks out, are afternoons or evenings better? Ok evenings, great, I have Thurs & Fri of that week available, which one works best for you? Thursday, great, how about 6:45pm? Perfect I will put you down and get you a party packet sent out and then follow up on some things you can do to have an awesome party once you receive your packet. You can use a similar type of script for recruiting too. Just change it up to set up a time for holding a recruiting interview or inviting them to your upline or team’s informational call, webinar or event. Remember just keep sharing & serving & you will get those parties booked and build your team! 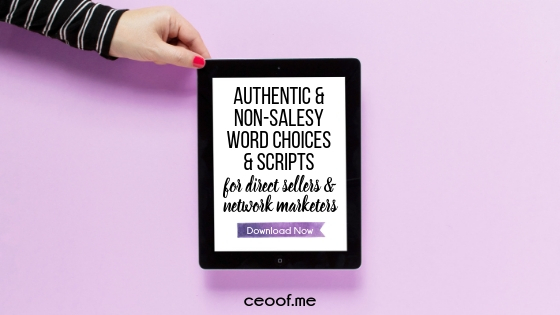 Be sure to grab the FREE 3 Page Download with the 3 scripts I shared above as well as business opportunity scripts AND bonus word choices to overcome common objections for sales, party bookings and team building. Enter your email below to get access right now to the download for FREE! Thank you so much Myra, I am so glad to hear you are enjoying it! Misty~ thank you so much for all of your hard work ! I appreciate the fact you share so much important information a zero cost to those of us who are growing our direct sales businesses! You have a wonderful heart and it shows! Thank you for helping us stay true to ourselves while making a living! I am just starting my 4th month in direct sales and am really having a hard time booking partly. Thank you so much for this and all your awesome advice- I can’t get enough!